It's that time of year yet again, Baradene sports awards, a night to sit back, relax, and celebrate the successes of the past sporting year! I was lucky enough to receive an invitation to the dinner along with many of the high achieving sportswomen at the school. We arrived sporting our whitest shirts and smartest uniforms to the Ellerslie Event Centre, and the night quickly kicked off. We had the first set of awards followed by a huge dinner, our guest speaker (a former all black) spoke then we got into the major awards! The excitement grew in anticipation of who the winners would be, so far I had won an outstanding achievement award for track cycling, a gold award for winning national events in cycling in 2013, and a silver award for representing Auckland in football. They started announcing the 'team of the year' awards, i exchanged nervous glances with the members of my Junior A cycling team as this was the award we were really aiming for. The Year 7/8 A cycling team won the Year 7/8 team of the year, the climbed on stage with all the cycling girls cheering loudly for them. Time for the Juniors, "and the winner of the Junior Team of the Year is............... JUNIOR A CYCLING TEAM! We all leapt up and I don't think we stopped smiling for the rest of the night! Now for the final award, for the 'Most Outstanding Performance of the Year', it is usually won by a senior and it is said to be the most prestigious award of the night. 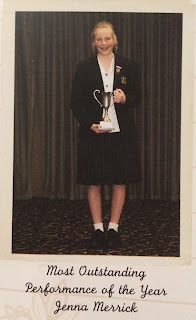 "but this year this award has been won by a junior, a sportswoman who has put 6 national titles to her name this year, Jenna Merrick", I actually can't begin to describe what I felt in the moment but the first thing I probably thought was "what?!". I was stunned, and absolutely in awe of how it could ever be me! With shaking legs I made my way onstage, my voice trembled all throughout my speech but I was extremely happy. I made my way back to my seat to be welcomed by all the cycling girls, and that was the end of the night! I walked out of the with 5 awards and a rather special trophy, one which I never dreamed of getting. In the car on the way home I read the names of the previous winners, two stuck out to me, Henrietta Mitchell, a track cyclist who went to the commonwealth games, and Emily Collins, a road cyclist who currently rides with a pro-cycling team in Europe. I couldn't believe that my name was among two of my heroes! What a night! Successful, and a great way to finish a hard year of sport! I'd like to congratulate all the award winners who worked so hard to get there, especially all the cycling girls who cleaned up fair chunk of the awards ending what has been, a phenomenal season.